Watford have gotten themselves, and deservedly so, back into this game although Chelsea will be disappointed at the soft manner of the goal. 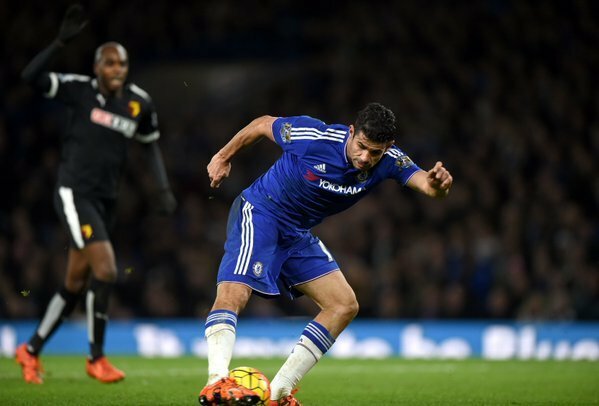 44 MINS: So Chelsea have a free kick in a dangerous position for Britos' foul on Costa. Willian, disappointingly, fires it well high. 45 MINS: CLOSE! Pedro's cross from the right flies across the box but Costa just can't get to the ball before the half-time whistle is blown. So it's 1-1 at the break! Costa and Deeney (penalty) with the goals! We'll be back in 15 minutes for more action from the Bridge as Chelsea and Watford attempt to push on and secure a victory. So we're back at the Bridge where Hiddink has seen enough from Fabregas, who has disappointed today. 48 MINS: Chelsea get a corner, before the fans appeal for handball and it seems the ball touches Britos' arm on its way into the box although it didn't look intentional. 55 MINS: CHANCE! The ball falls to Capoue who tests Courtois with a fine low drive before it's parried back into his path. The former Tottenham man then fires the ball back at goal but Terry clears the danger. 56 MINS: GOAL! 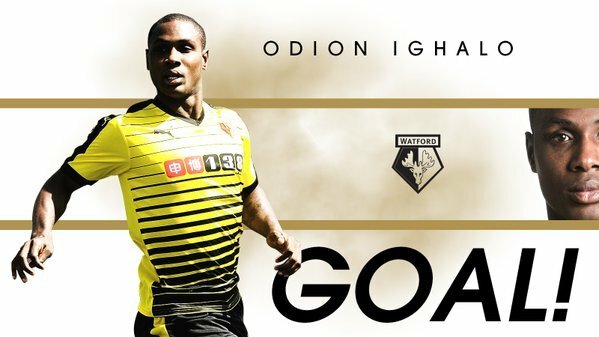 Ighalo makes it 2-1 to Watford! Jurado showed some great determination in the build-up to that goal, after dribbling past Mikel and setting up Ighalo who used his fancy footwork to get the ball past Cahill and over Courtois into the net. The ball took a deflection off the Chelsea defender, who didn't do enough to pressurise Ighalo enough. Chelsea 1-2 Watford! 64 MINS: GOAL! Costa makes it 2-2 to Chelsea! What a finish from Costa! Willian has to be credited for yet another superb ball into the area - past four Watford players too - which the Chelsea striker fired in past Gomes. 2-2! Minutes later, Costa nearly gives Chelsea the lead but Gomes does enough to parry the ball out although the Blues don't get a corner. 68: First sub of the afternoon for #watfordfc, as Valon Behrami replaces Almen Abdi in midfield. 73: Second substitute for #watfordfc, as Ikechi Anya replaces Jurado. 75 MINS: Chelsea win a free kick just outside the box, but Willian can only fire his shot high. 78 MINS: PENALTY TO CHELSEA! Behrami gives away a spot-kick for a poor, poor challenge on Hazard in the area but Oscar can only blast it high slipping in the process! Costa has gotten a late yellow card for a careless foul - and he will miss the trip to Manchester United on Monday. Full-time: And Chelsea earn a point at home to Watford in an entertaining affair! The Blues will feel they could have, and should have, gotten all three points but Oscar fired his late penalty high. We'll have player ratings and reaction very soon! Check out our player ratings from today's game right here! Manchester United are always very difficult and in three days we are playing two games. We have to cope with that but we will be ready I am sure. Diego Costa will now be suspended for Chelsea's trip to face Manchester United on Monday - a massive loss considering his superb performance today. We have more reaction on our site, but thanks for following the live blog with us today! We'll be back on Monday for Manchester United's clash with Chelsea at Old Trafford! Good night!